"Is there anything more enticing than curling up with a thrilling whodunit that keeps you guessing until the very end? Susan Boyer delivers big time with a witty mystery that is fun, radiant, and impossible to put down. I LOVE THIS BOOK " - New York Times Bestselling Author, Darynda Jones Private Investigator Liz Talbot thinks she's seen another ghost when she meets Calista McQueen, who's the spitting image of Marilyn Monroe. Born precisely fifty years after the ill-fated star, Calista's life has eerily mirrored the late starlet's - and she fears the looming anniversary of Marilyn's death will also be hers. Before Liz can open a case file, Calista's life coach is executed. Suspicious characters swarm around Calista like mosquitoes on a sultry lowcountry evening: her mother, fake aunt, psychoanalyst, yoga instructor, housekeeper, and an obsessed ex-husband. With the heat index approaching triple digits, Liz races to uncover a diabolical murder plot in time to save not only Calista's life, but also her own. 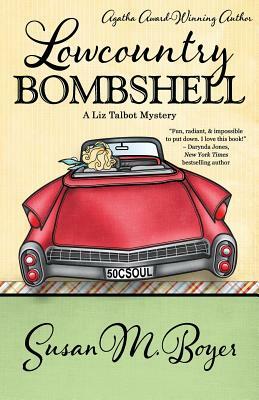 Part of the Henery Press Mystery Series Collection, if you like one, you'll probably like them all LOWCOUNTRY BOMBSHELL is the second in the award-winning Liz Talbot Southern mystery series. In case you missed the first one, check out LOWCOUNTRY BOIL, winner of the Agatha Award for Best First Novel.